(Nanowerk News) A research team at RIKEN has succeeded for the first time in selectively controlling for reaction products in the dissociation of a single water molecule on an ultrathin film. The reaction, described in the April 19th issue of Nature Materials, opens the door to the creation of novel functional catalysts and applications in clean energy production. In recent years, the knowledge that materials exhibit novel properties at the nano-scale has driven a search for functional nano-materials with useful applications. Among these, ultrathin metal oxide films have attracted attention for their application in reaction catalysis, yet mechanisms underlying this catalytic role have remained unclear. 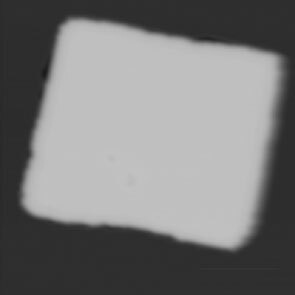 Left: Figure 1: STM image of ultrathin MgO film on Ag(100) surface. 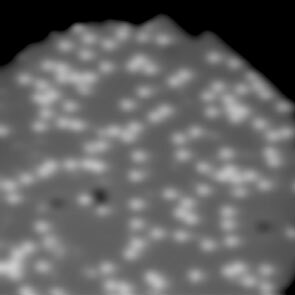 Right: Figure 2: STM image of isolated water molecules adsorbed on ultrathin MgO surface. 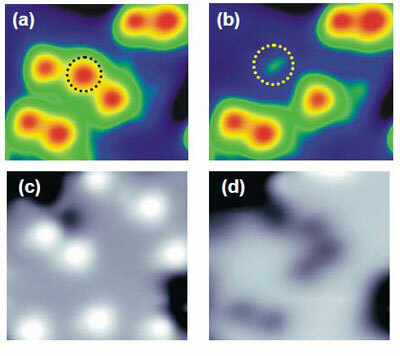 Using a scanning tunneling microscope (STM) at ultra-low temperatures, the research team explored the dynamics of single water molecules interacting with a film of magnesium oxide (MgO) several atoms in thickness (Figure 1). They discovered that by injecting tunnelling electrons into water molecules on the MgO surface (Figure 2), they could select between dissociation pathways: excitation of the molecule’s vibrational states induced dissociation into hydroxyl (H + OH) (Figure 3 (a) and (b)), whereas excitation of its electronic states induced dissociation into atomic oxygen (O) (Figure 3 (c) and (d)). Figure 3: STM images of water molecule before (a) and after (b) dissociation into OH, and before (c) and after (d) dissociation into O. The controlled dissociation of water molecules via selected reaction pathways presents unique opportunities in targeted catalysis, particularly in the production of hydrogen, a potential source of clean energy. While advancing our understanding of the dynamics of water molecules, the discovery also sets the stage for applications in the catalysis of more complex systems on insulating films. RIKEN, Japan’s flagship research organization, conducts basic and applied experimental research in a wide range of science and technology fields including physics, chemistry, medical science, biology and engineering.